Income Tax Clinic 2018 is coming! Following our success last year, DD Community Connector is in preparation for the Income Tax Clinic 2018. We are now recruiting certified CPA or student pursuing a CPA qualification to help people and families with intellectual disabilities to file their tax return. 1. You have previous personal tax filing experiences for someone other than yourself. 2. You are either a qualified CPA, or a student pursuing CPA or equivalent qualification. 3. Ability to speak Mandarin, Cantonese or any non-official languages is a great asset. Applicants who meet the eligibility requirements will need to go through CRA screening process. 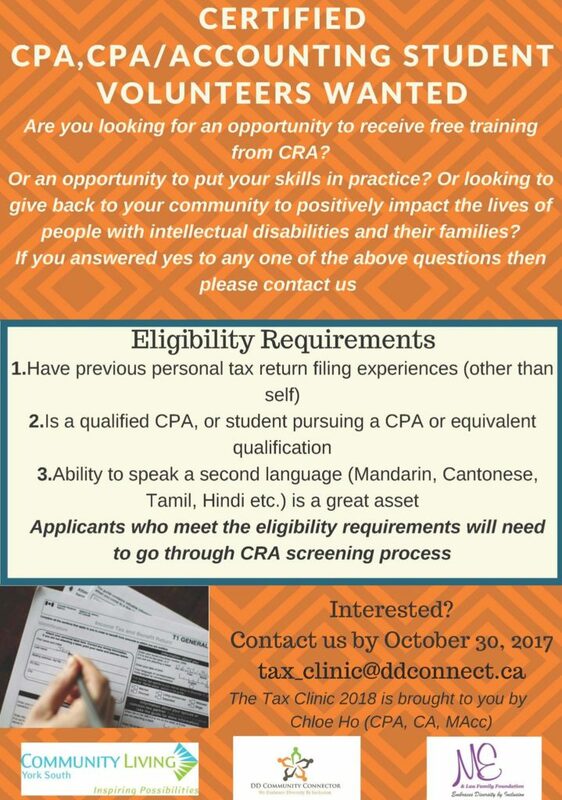 If you are interested, please contact us by October 30, 2017 by emailing tax_clinic@ddconnect.ca.